Hazardous materials are products that pose a risk to health, safety, and property during transportation. The term often is shortened to HAZMAT, which you may see on road signs, or to HM in government regulations. Hazardous materials include explosives, various types of gas, solids, flammable and combustible liquid, and other materials. Because of the risks involved and the potential consequences these risks impose, the handling of hazardous materials is very heavily regulated by all levels of government. The Hazardous Materials Regulations (HMR) are found in parts 171-180 of title 49 of the Code of Federal Regulations. The common reference for these regulations is 49 CFR 171-180. 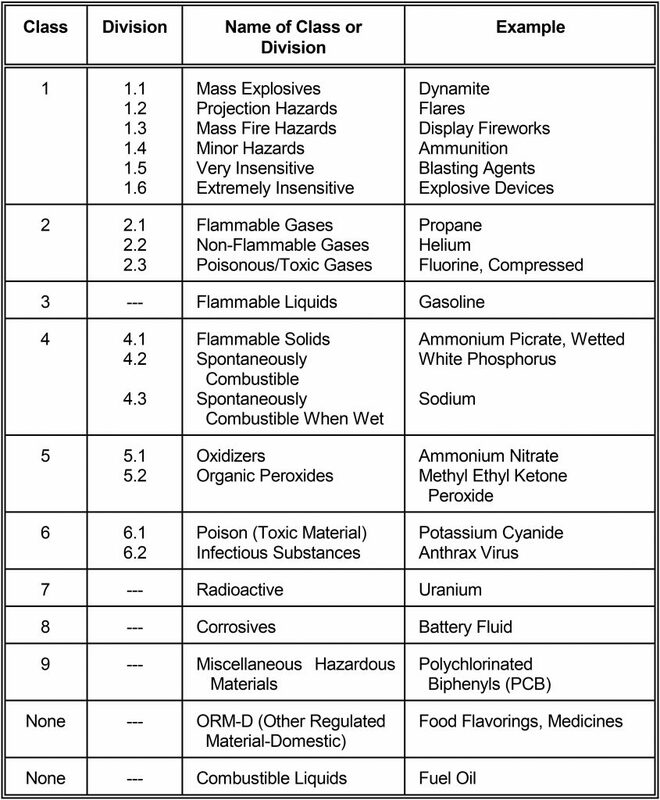 The Hazardous Materials Table in these regulations contains a list of these items. However, this list is not all-inclusive. Whether or not a material is considered hazardous is based on its characteristics and the shipper's decision on whether or not the material meets a definition of a hazardous material in the regulations. 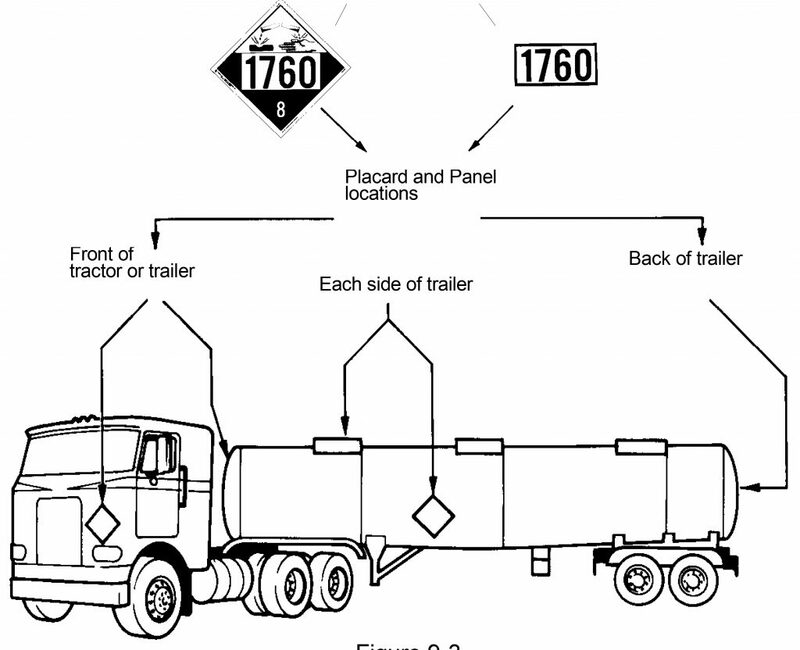 This section is designed to assist you in understanding your role and responsibilities in hauling hazardous materials. Due to the constantly changing nature of government regulations, it is impossible to guarantee absolute accuracy of the materials in this section. An up-to-date copy of the complete regulations is essential for you to have. Included in these regulations is a complete glossary of terms. You must have a commercial driver license (CDL) with a hazardous materials endorsement before driving vehicles carrying hazardous materials which require placards. You must pass a written test about the regulations and requirements to get this endorsement. Everything you need to know to pass the written test is in this section. However, this is only a beginning. Most drivers need to know much more on the job. You can learn more by reading and understanding the federal and state rules applicable to hazardous materials as well as attending hazardous materials training courses. These courses are usually offered by your employer, colleges and universities, and various associations. You can get copies of the Federal Regulations (49 CFR) through your local Government Printing Office bookstore and various industry publishers. Union or company offices often have copies of the rules for driver use. Find out where you can get your own copy to use on the job. The regulations require training and testing for all drivers involved in transporting hazardous materials. Your employer or a designated representative is required to provide this training and testing. Hazardous materials employers are required to keep a record of that training on each employee as long as that employee is working with hazardous materials, and for 90 days thereafter. The regulations require that hazardous materials employees be trained and tested at least once every two years. The regulations also require that drivers have special training before driving a vehicle transporting certain flammable gas materials or highway route controlled quantities of radioactive materials. In addition, drivers transporting cargo tanks and portable tanks must receive specialized training. Each driver's employer or their designated representative must provide such training. Some locations require permits to transport certain explosives or bulk hazardous wastes. States and counties also may require drivers to follow special hazardous materials routes. The federal government may require permits or exemptions for special hazardous materials cargo such as rocket fuel. Find out about permits, exemptions, and special routes for places you drive. Transporting hazardous materials can be risky. The regulations are intended to protect you, those around you, and the environment. They tell shippers how to package the materials safely and drivers how to load, transport, and unload the material. These are called "containment rules." To communicate the risk, shippers must warn drivers and others about the material's hazards. The regulations require shippers to put hazard warning labels on packages, provide proper shipping papers, emergency response information, and placards. These steps communicate the hazard to the shipper, the carrier, and the driver. Identify what are hazardous materials. Learn the rules and follow them. Following the rules reduces the risk of injury from hazardous materials. Taking shortcuts by breaking rules is unsafe. Rule breakers can be fined and put in jail. Inspect your vehicle before and during each trip. Law enforcement officers may stop and inspect your vehicle. When stopped, they may check your shipping papers, vehicle placards, the hazardous materials endorsement on your driver license, and your knowledge of hazardous materials. Sends products from one place to another by truck, rail, vessel, or airplane. - Correct label and markings. Must package, mark, and label the materials; prepare shipping papers; provide emergency response information; and supply placards. tanks supplied by you or your employer). Prior to transportation, checks that the shipper correctly described, marked, labeled, and otherwise prepared the shipment for transportation. Makes sure the shipper has identified, marked, and labeled the hazardous materials properly. A material's hazard class reflects the risks associated with it. There are nine different hazard classes. Figure 9-1 tells the exact meaning of each hazard class. The types of materials included in these nine classes are in the table below. A shipping paper describes the hazardous materials being transported. Shipping orders, bills of lading, and manifests are all shipping papers. Figure 9-6 shows an example shipping paper. Require carriers and drivers to put tabs on hazardous materials shipping papers, or keep them on top of other shipping papers and keep the required emergency response information with the shipping papers. - On the driver's seat when out of the vehicle. Shippers put diamond-shaped hazard warning labels on most hazardous materials packages. These labels inform others of the hazard. If the diamond label won't fit on the package, shippers may put the label on a tag securely attached to the package. For example, compressed gas cylinders that will not hold a label will have tags or decals. Labels look like the example in Figure 9-2. Placards are used to warn others of hazardous materials. Placards are signs put on the outside of a vehicle which identify the hazard class of the cargo. A placarded vehicle must have at least four identical placards. They are put on the front, rear, and both sides of the vehicle (see Figure 9-3). Placards must be readable from all four directions. They are 10 3/4 inches square, square-on-point, in a diamond shape. Cargo tanks and other bulk packaging display the identification number of their contents on placards or orange panels or white square-on-point displays that are the same size as placards. Hazardous material identification numbers may be displayed on placards or orange panels. The Hazardous Materials Table. 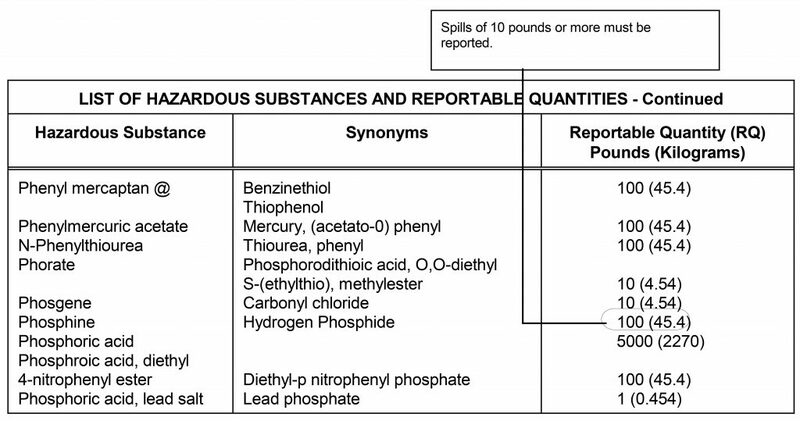 Figure 9-4 shows part of the Hazardous Materials Table. Column 1 tells which shipping mode(s) the entry affects and other information concerning the shipping description. The next five columns show each material's shipping name, hazard class or division, identification number, packaging group, and required labels. Five different symbols may appear in Column 1 of the table. Column 5 shows the packing group assigned to a material. Column 6 shows the hazard warning label(s) shippers must put on packages of hazardous materials. Some products require use of more than one label due to a dual hazard being present. No label is needed where the table shows the word NONE. Column 7 lists the additional (special) provisions that apply to this material. When there is an entry in this column, you must refer to the federal regulations for specific information. Appendix A to §172.101 - The List of Hazardous Substances and Reportable Quantities. 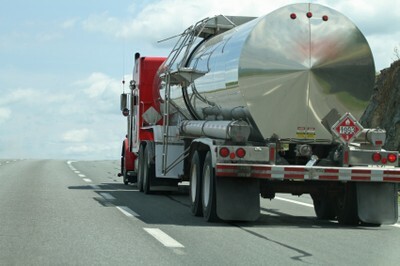 The DOT and the EPA want to know about spills of hazardous substances. 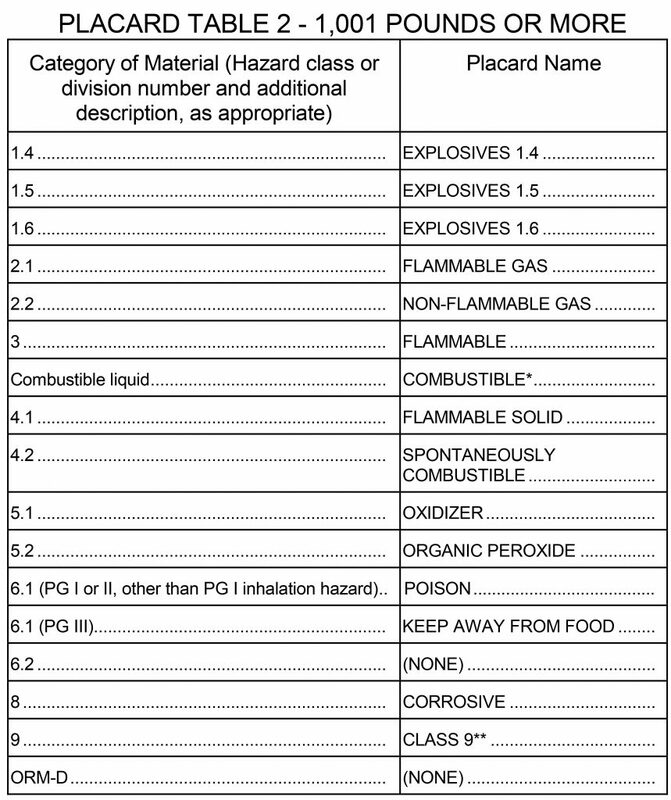 They are named in the List of Hazardous Substances and Reportable Quantities (see Figure 9-5). 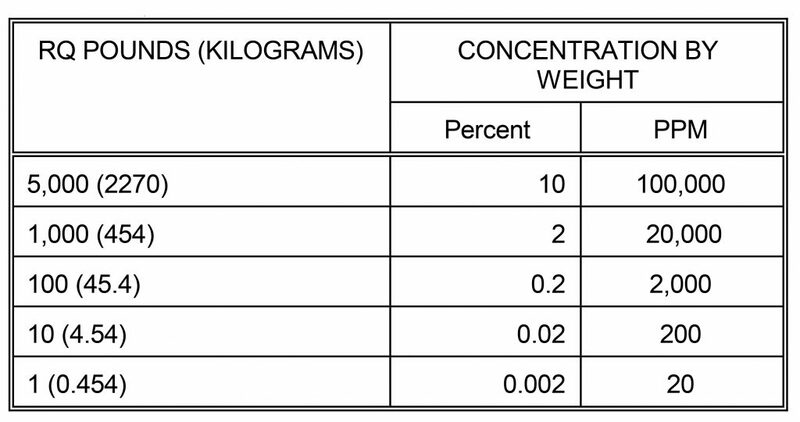 Column 3 of the list shows each product's reportable quantity (RQ). When these materials are being transported in a reportable quantity or greater in one package, the shipper displays the letters RQ on the shipping paper and package. The letters RQ may appear before or after the basic description. You or your employer must report any spill of these materials which occurs in a reportable quantity. If the words INHALATION HAZARD appear on the shipping paper or package, the rules require display of the POISON or POISON GAS placards, as appropriate. These placards must be used in addition to other placards which may be required by the product's hazard class. Always display the hazard class placard and the POISON placard, even for small amounts. Drivers placard their vehicle to (fill in the blank) the risk. blank). The identification number must also appear on cargo tanks and other bulk packagings. These questions may be on your test. If you can't answer them all, re-read pages 9-1 through 9-9. Page numbers if the shipping paper has more than one page. The first page must tell the total number of pages. For example, "Page 1 of 4." A "shipper's certification," signed by the shipper, saying they prepared the shipment according to the rules. The basic description of hazardous materials includes the proper shipping name, hazard class or division, the identification number, and the packing group, if any, in that order. The packing group is displayed in Roman numerals and may be preceded by "PG." For "n.o.s." and generic descriptions, the technical name of the hazardous material. The shipper of hazardous wastes must put the word WASTE before the proper shipping name of the material on the shipping paper (hazardous waste manifest). For example: Waste Acetone, 3, UN1090, PG 11. If rules require it, the shipper will put RQ or INHALATION-HAZARD on the package. Packages with liquid containers inside will also have package orientation markings with the arrows pointing in the correct upright direction. The labels used always reflect the hazard class of the product. If a package needs more than one label, the labels will be close together, near the proper shipping name. Always make sure that the shipper shows the correct basic description on the shipping paper and verifies that the proper labels are shown on the packages. If you are not familiar with the material, ask the shipper to contact your office. There are two placard tables, Table 1 and Table 2. Table 1 materials must be placarded whenever any amount is transported. If the words INHALATION HAZARD are on the shipping paper or package, you must display POISON placards in addition to any other placards needed by the product's hazard class. 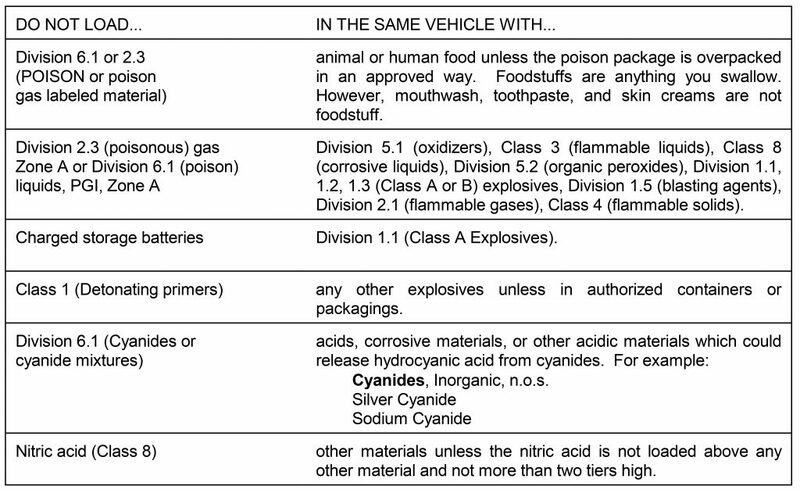 You need not use EXPLOSIVES 1.5, OXIDIZER, and DANGEROUS placards if a vehicle contains Division 1.1 or 1.2 explosives and is placarded with EXPLOSIVES 1.1 or 1.2 placards. You need not use a Division 2.2 NON-FLAMMABLE GAS placard on a vehicle displaying a Division 2.1 FLAMMABLE GAS or for oxygen a Division 2.2 OXYGEN placard. Placards used to identify the primary hazard class of a material must have the hazard class or division number displayed in the lower corner of the placard. No hazard class or division number is allowed on placards used to identify a secondary hazard class of a material. * FLAMMABLE placard may be used in place of a COMBUSTIBLE placard on a cargo tank or portable tank. What is a shipper's certification? Where does it appear? Who signs it? 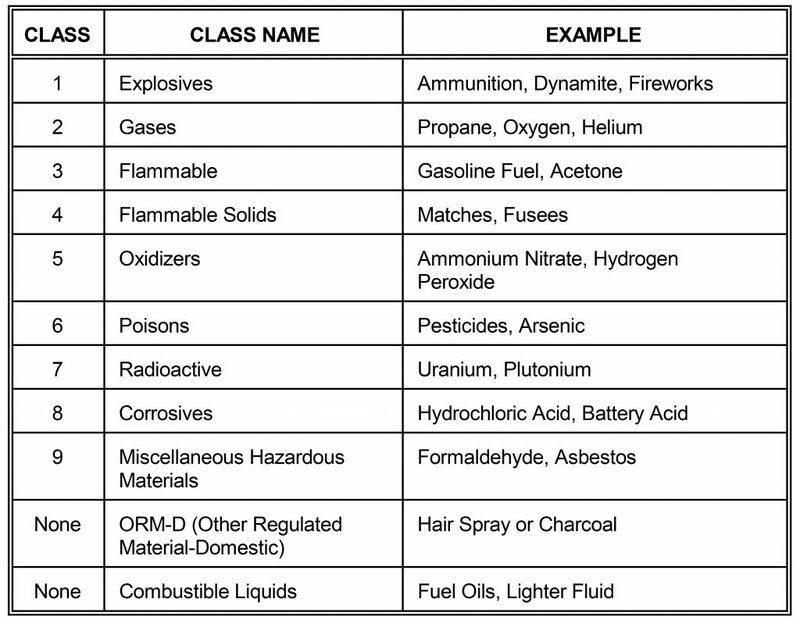 When may non-hazardous materials be described by hazard class words or identification numbers? Name five hazard classes that require placarding in any amount. A shipment described on the Hazardous Waste Manifest may only be delivered to another (fill in the blank) carrier or treatment facility, which then signs the (fill in the blank) giving you a copy which you must keep. Your load includes 20 pounds of Division 2.3 gas and 1,001 pounds of flammable gas. What placards do you need, if any? These questions may be on your test. If you can't answer them all, re-read pages 9-10 through 9-15. Do all you can to protect containers of hazardous materials. Don't use any tools which might damage containers or other packaging during loading. Don't use hooks. Before loading or unloading, set the parking brake. Make sure the vehicle will not move. Many products become more hazardous when exposed to heat. Load hazardous materials away from heat sources. Watch for signs of leaking or damaged containers: LEAKS SPELL TROUBLE! Do not transport leaking packages. Depending on the material, you, your truck, and others could be in danger. 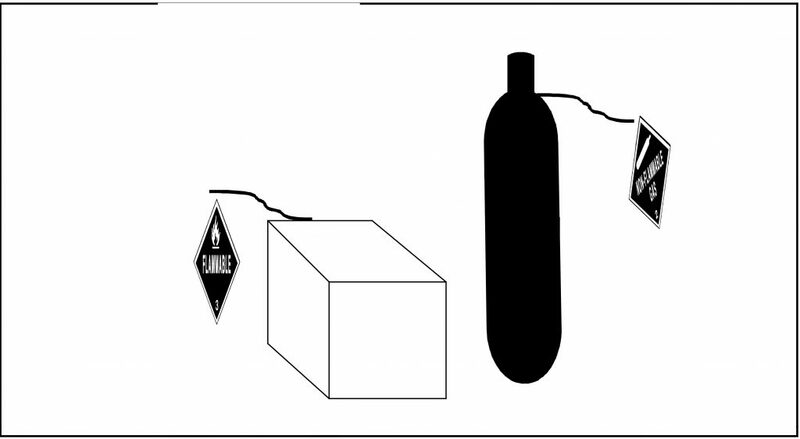 Containers of Class 1 (explosives), Class 3 (flammable liquids), Class 4 (flammable solids), Class 5 (oxidizers), Class 8 (corrosives), Class 2 (gases), and Division 6.1 (poisons) must be braced to prevent movement of the packages during transportation. Secure Against Movement. Brace containers so they will not fall, slide, or bounce around during transportation. Be very careful when loading containers that have valves or other fittings. The rules usually forbid use of cargo heaters, including automatic cargo heater/air conditioner units. Unless you have read all the related rules, don't load the above products in a cargo space that has a heater. Covered with a fire and water resistant tarp. Disable cargo heaters. Disconnect heater power sources and drain heater fuel tanks. Make sure there are no sharp points that might damage cargo. Look for bolts, screws, nails, broken side panels, and broken floor boards. either non-metallic material or non-ferrous metal. Use extra care to protect explosives. Never use hooks or other metal tools. Never drop, throw, or roll packages. Protect explosive packages from other cargo that might cause damage. Do not transfer a Division 1.1, 1.2, or 1.3 (Class A or B explosive) from one vehicle to another on a public roadway except in an emergency. If safety requires an emergency transfer, set out red warning reflectors, flags, or electric lanterns. You must warn others on the road. Never transport damaged packages of explosives. Do not take a package that shows any dampness or oily stain. There is a marked or placarded cargo tank in the combination. − Division 1.1 A (initiating explosives). − Packages of Class 7 (radioactive) materials labeled "Yellow III." − Division 2.3 (poisonous gas) or Division 6.1 (poisonous) materials. − Hazardous materials in a portable tank, on a DOT Spec 106A or 110A tank. Class 8 (Corrosive) Materials. If loading by hand, load breakable containers of corrosive liquid one by one. Keep them right side up. Do not drop or roll the containers. Load them onto an even floor surface. Stack carboys only if the lower tiers can bear the weight of the upper tiers safely. Do not load nitric acid above any other product, or stack more than two high. Load charged storage batteries so their liquid won't spill. Keep them right side up. Make sure other cargo won't fall against or short circuit them. Division 2.3, Zone B (Poisonous Gases). Division 1.1 or 1.2 (Explosives A). Division 1.2 or 1.3 (Explosives B). Division 2.3, Zone A (Poisonous Gases). Division 4.2 (Spontaneously Combustible Materials). Division 6.1, PGI, Zone A (Poison Liquids). Held upright or braced laying down flat. In racks attached to the vehicle. In boxes that will keep them from turning over. Division 2.3 (Poisonous Gas) or Division 6.1 (Poisonous) Materials. Never transport these materials in containers with interconnections. Never load a package labeled POISON or POISON GAS in the driver's cab or sleeper or with food material for human or animal consumption. Class 7 (Radioactive) Materials. Some packages of Class 7 (radioactive) materials bear a number called the "transport index." The shipper labels these packages Radioactive II or Radioactive III, and prints the package's transport index on the label. Radiation surrounds each package, passing through all nearby packages. To deal with this problem, the number of packages you can load together is controlled. Their closeness to people, animals, and unexposed film is also controlled. The transport index tells the degree of control needed during transportation. The total transport index of all packages in a single vehicle must not exceed 50. Appendix A to this section shows rules for each transport index. It shows how close you can load Class 7 (radioactive) materials to people, animals, or film. For example, you can't leave a package with a transport index of 1.1 within two feet of people or cargo space walls. Mixed loads. The rules require some products to be loaded separately. You cannot load them together in the same cargo space. Figure 9-7 lists some examples. The regulations (the Segregation and Separation Chart) name other materials you must keep apart. Around which hazard classes must you never smoke? Which three hazard classes should not be loaded into a trailer that has a heater/air conditioner unit? Should the floor liner required for Division 1.1 or 1.2 (Explosives A) be stainless steel? pounds of dry Silver Cyanide on board. What precautions do you have to take? These questions may be on your test. If you can't answer them all, re-read Section 9.4. The glossary at the end of this section gives the meaning of the word bulk. Cargo tanks are bulk packagings permanently attached to a vehicle. Cargo tanks remain on the vehicle when you load and unload them. Portable tanks are bulk containers which are not permanently attached to a vehicle. The product is loaded or unloaded while the portable tanks are off the vehicle. Portable tanks are then put on a vehicle for transportation. There are many types of cargo tanks in use. The most common cargo tanks are MC306 for liquids and MC331 for gases. You must display the identification number of the hazardous materials in portable tanks and cargo tanks and other bulk packagings (such as dump trucks). Identification numbers are in column 4 of the Hazardous Materials Table. The rules require black 100 mm (3.9 inch) numbers on orange panels, placards, or a white, diamond-shaped background if no placards are required. Specification cargo tanks must show re-test date markings. Portable tanks must also show the lessee or owner's name. They must also display the shipping name of the contents on two opposing sides. The letters of the shipping name must be at least two inches tall on portable tanks with capacities of more than 1,000 gallons and one-inch tall on portable tanks with capacities of less than 1,000 gallons. The identification number must appear on each side and each end of a portable tank or other bulk packaging that hold 1,000 gallons or more and on two opposing sides, if the portable tank holds less than 1,000 gallons. The identification numbers must still be visible when the portable tank is on the motor vehicle. If they are not visible, you must display the identification number on both sides and ends of the motor vehicle. Have a clear view of the cargo tank. Be within 25 feet of the tank. Know of the hazards of the materials involved. Know the procedures to follow in an emergency. Be authorized to move the cargo tank and able to do so. Close all manholes and valves before moving a tank of hazardous materials, no matter how small the amount in the tank or how short the distance. Manholes and valves must be closed to prevent leaks. Turn off your engine before loading or unloading any flammable liquids. Only run the engine if needed to operate a pump. Ground a cargo tank correctly before filling it through an open filling hole. Ground the tank before opening the filling hole, and maintain the ground until after closing the filling hole. Keep liquid discharge valves on a compressed gas tank closed except when loading and unloading. Unless your engine runs a pump for product transfer, turn it off when loading or unloading. If you use the engine, turn it off after product transfer, before you unhook the hose. Unhook all loading/unloading connections before coupling, uncoupling, or moving a chlorine cargo tank. Always chock trailers and semi-trailers to prevent motion when uncoupled from the power unit. How is a portable tank different from a cargo tank? before or after unhooking hoses after delivery? These questions may be on your test. If you can't answer them all, re-read Section 9.5. A bridge, tunnel, or building. A place where people gather. If you must park to do your job, do so only briefly. You are allowed to leave your vehicle unattended in a safe haven. A safe haven is an approved place for parking unattended vehicles loaded with explosives. Designation of authorized safe havens are usually made by local authorities. You may park a placarded vehicle (not laden with explosives) within five feet of the travelled part of the road only if your work requires it. Do so only briefly. Someone must always watch the vehicle when parked on a public roadway or shoulder. Do not uncouple a trailer and leave it with hazardous materials on a public street. Do not park within 300 feet of an open fire. Be in the vehicle, awake, and not in the sleeper berth, or within 100 feet of the vehicle and have it within clear view. Be aware of the hazards of the materials being transported. Know what to do in emergencies. Be able to move the vehicle, if needed. Tank used for Class 3 (flammable liquids) or Division 2.1 (flammable gas) whether loaded or empty. Vehicle loaded with Division 1.1, 1.2, or 1.3 (Class A or B) explosives. Some states and counties require permits to transport hazardous materials or wastes. They may limit the routes you can use. Local rules about routes and permits change often. It is your job as driver to find out if you need permits or must use special routes. Make sure you have all needed papers before starting. If you work for a carrier, ask your dispatcher about route restrictions or permits. If you are an independent trucker and are planning a new route, check with state agencies where you plan to travel. Some localities prohibit transportation of hazardous materials through tunnels, over bridges, or other roadways. Check before you start. Whenever placarded, avoid heavily populated areas, crowds, tunnels, narrow streets, and alleys. Take other routes, even if inconvenient, unless there is no other way. Never drive a placarded vehicle near open fires unless you can safely pass without stopping. If transporting Division 1.1, 1.2, or 1.3 (Class A or B) explosives, you must have a written route plan and follow that plan. Carriers prepare the route plan in advance and give the driver a copy. You may plan the route yourself if you pick up the explosives at a location other than your employer's terminal. Write out the plan in advance. Keep a copy of it with you while transporting the explosives. Deliver shipments of explosives only to authorized persons or leave them in locked rooms designed for explosives storage. A carrier must choose the safest route to transport placarded radioactive materials. After choosing the route, the carrier must tell the driver about the radioactive materials, and show the route plan. Turn off your engine before fueling a motor vehicle containing hazardous materials. Someone must always be at the nozzle, controlling fuel flow. The power unit of placarded vehicles must have a fire extinguisher with a UL rating of 10 B:C or more. Make sure your tires are properly inflated. Check placarded vehicles with dual tires at the start of each trip and when you park. You must stop and check the tires every 2 hours or 100 miles, whichever is less. The only acceptable way to check tire pressure is to use a tire pressure gauge. Do not drive with a tire that is leaking or flat except to the nearest safe place to fix it. Remove any overheated tire. Place it a safe distance from your vehicle. Don't drive until you correct the cause of the overheating. Remember to follow the rules about parking and attending placarded vehicles. They apply even when checking, repairing, or replacing tires. Do not accept a hazardous materials shipment without a properly prepared shipping paper. 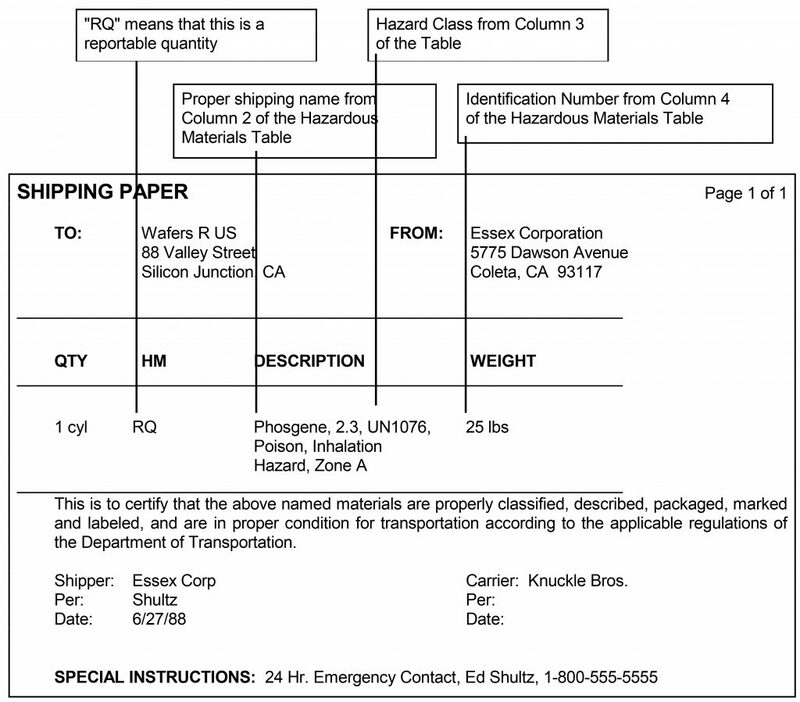 A shipping paper for hazardous materials must always be easily recognized. Other people must be able to find it quickly after an accident. Clearly distinguish hazardous materials shipping papers from others by tabbing them or keeping them on top of the stack of papers. When you are behind the wheel, keep shipping papers within your reach (with your seat belt on), or in a pouch on the driver's door. They must be easily seen by someone entering the cab. When not behind the wheel, leave shipping papers in the driver's door pouch or on the driver's seat. Emergency response information must be kept in the same location as the shipping paper. The names and telephone numbers of people to contact (including carrier agents or shippers). The nature of the explosives transported. The precautions to take in emergencies such as fires, accidents, or leaks. Drivers must sign a receipt for these documents. A copy of FMCSR, Part 397. A driver transporting chlorine in cargo tanks must have an approved gas mask in the vehicle. 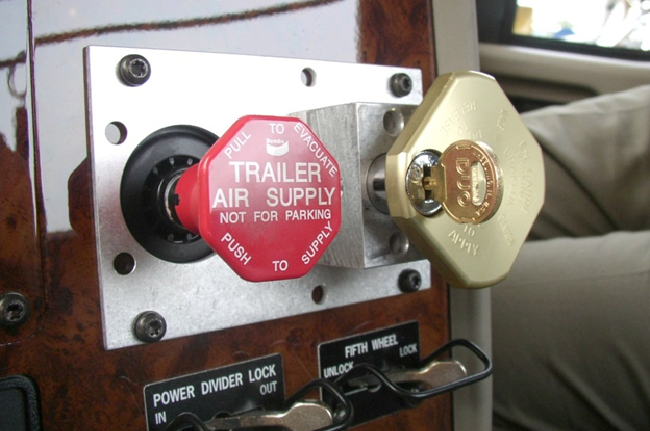 The driver must also have an emergency kit for controlling leaks in dome cover plate fittings on the cargo tank. Carries any amount of chlorine. Has cargo tanks, whether loaded or empty, used for hazardous materials. You must stop 15 to 50 feet before the nearest rail. Proceed only when you are sure no train is coming. Don't shift gears while crossing the tracks. You might have to control minor truck fires on the road. However, unless you have the training and equipment to do so safely, don't fight hazardous materials fires. Dealing with hazardous materials fires requires special training and protective gear. When you discover a fire, send for help. You may use the fire extinguisher to keep minor truck fires from spreading to cargo before firefighters arrive. Feel trailer doors to see if they are hot before opening them. If hot, you may have a cargo fire and should not open the doors. Opening doors lets air in and may make the fire flare up. Without air, many fires only smolder until firemen arrive, doing less damage. If your cargo is already on fire, it is not safe to fight the fire. Keep the shipping papers with you to give to emergency personnel as soon as they arrive. Warn other people of the danger and keep them away. If you discover a cargo leak, identify the hazardous materials leaking by using shipping papers, labels, or package location. Do not touch any leaking material--many people injure themselves by touching hazardous materials. Do not try to identify the material or find the source of a leak by smell. Toxic gases can destroy your sense of smell and can injure or kill you even if they don't smell. Never eat, drink, or smoke around a leak or spill. If hazardous materials are spilling from your vehicle, do not move it any more than safety requires. You may move off the road and away from places where people gather, if doing so serves safety. Only move your vehicle if you can do so without danger to yourself or others. Never continue driving with hazardous materials leaking from your vehicle in order to find a phone booth, truck stop, help, or similar reason. Remember, the carrier pays for the cleanup of contaminated parking lots, roadways, and drainage ditches. Your name, the carrier's name, and the name of the community or city where your terminal is located. Never move your vehicle, if doing so will cause contamination or damage the vehicle. Keep downwind and away from roadside rests, truckstops, cafes, and businesses. Never try to repack leaking containers. Unless you have the training and equipment to repair leaks safely, don't try it. Call your dispatcher or supervisor for instructions and, if needed, emergency personnel. Never transport a leaking cargo tank farther than needed to reach a safe place. Get off the roadway if you can do so safely. Don't transfer flammable liquid from one vehicle to another on a public roadway except in an emergency. If Division 6.2 (infectious substances) package is damaged in handling or transportation, you should immediately contact your supervisor. Packages which appear to be damaged or shows signs of leakage should not be accepted. If continuing to transport a leaking tank would be unsafe, get off the road. If safe to do so, try to contain any liquid leaking from the vehicle. Keep bystanders away from the liquid and its fumes. Do everything possible to prevent injury to others. The general public is evacuated for one or more hours. One or more major transportation arteries or facilities are closed or shut down for one hour or more. Fire, breakage, spillage, contamination occurs. Fire, breakage, spillage or suspected contamination occurs involving shipment of etiologic agents (bacteria or toxins). situation exists of such a nature (e.g., continuing danger to life exists at the scene of an incident) that, in the judgment of the carrier, should be reported. If your placarded trailer has dual tires, how often should you check the tires? How close to the travelled part of the roadway can you park with Division 1.2 or 1.3 (Explosive B)? How close can you park to a bridge, tunnel, or building with the same load? What type of fire extinguisher must placarded vehicles carry? You're hauling 100 pounds of Division 4.3 (dangerous when wet) material. Do you need to stop before railroad crossings? At a rest area you discover your hazardous materials shipments slowly leaking from the vehicle. There's no phone around. What should you do? What is the Emergency Response Guide (ERG)? These questions may be on your test. If you can't answer them all, re-read Sections 9.6 and 9.7. 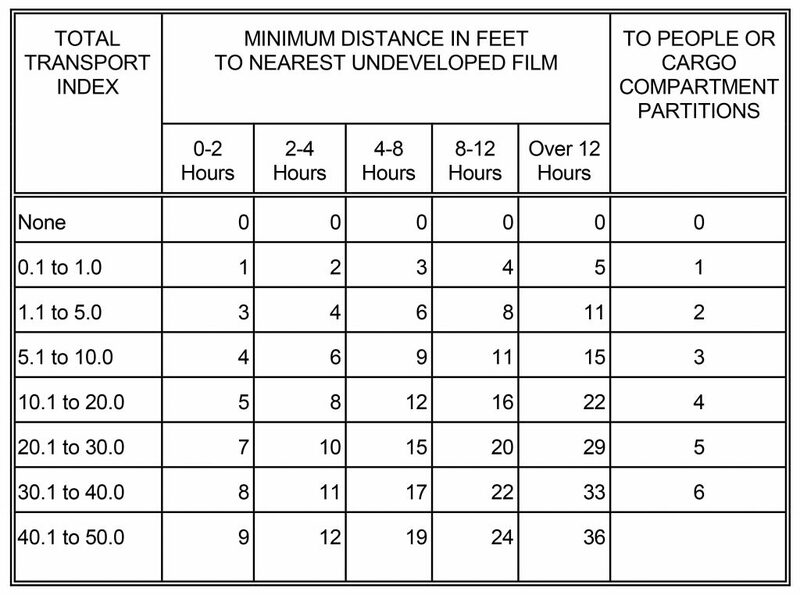 Do not leave radioactive yellow - II or yellow - III labeled packages near people, animals, or film longer than shown in this table. (3) A water capacity greater than 454 kg (1000 pounds) as a receptacle for a gas as defined in Sec. 173.115. (3) Is not fabricated under a specification for cylinders, portable tanks, tank cars, or multi-unit tank car tanks. FMCSR means the Federal Motor Carrier Safety Regulations. Fuel tank means a tank, other than a cargo tank, used to transport flammable or combustible liquid or compressed gas for the purpose of supplying fuel for propulsion of the transport vehicle to which it is attached, or for the operation of other equipment on the transport vehicle. Hazard class means the category of hazard assigned to a hazardous material under the definitional criteria of Part 173 and the provisions of the Sec. 172.101 Table. A material may meet the defining criteria for more than one hazard class but is assigned to only one hazard class. Hazardous materials means a substance or material which has been determined by the Secretary of Transportation to be capable of posing an unreasonable risk to health, safety, and property when transported in commerce, and which has been so designated. The term includes hazardous substances, hazardous wastes, marine pollutants, and elevated temperature materials as defined in this section, materials designated as hazardous under the provisions of Sec. 172.101 and 172.102, and materials that meet the defining criteria for hazard classes and divisions in Part 173. (i) For radionuclides, conforms to paragraph 6 of Appendix A to Sec. 172.101. Limited quantity, when specified as such in a section applicable to a particular material, means the maximum amount of a hazardous materials for which there may be specific labeling or packaging exception. Marking means the descriptive name, identification number, instructions, cautions, weight, specification, or UN marks or combinations thereof, required by this subchapter on outer packagings of hazardous materials. Name of contents means the proper shipping name as specified in Sec. 172.101. (3) A water capacity greater than 454 kg (1,000 pounds) or less as a receptacle for a gas as defined in Sec. 173.115. Portable tank means a bulk packaging (except a cylinder having a water capacity of 1,000 pounds or less) designed primarily to be loaded onto, or on, or temporarily attached to a transport vehicle or ship and equipped with skids, mountings, or accessories to facilitate handling of the tank by mechanical means. It does not include a cargo tank, tank car, multi-unit tank car tank, or trailer carrying 3AX, 3AAX, or 3T cylinders. Proper shipping name means the name of the hazardous materials shown in Roman print (not italics) in Sec. 172.101. Reportable quantity (RQ) means the quantity specified in Column 3 of the Appendix to Sec. 172.101 for any material identified in Column 1 of the Appendix. RSPA means the Research and Special Programs Administration, U.S.
Department of Transportation, Washington, DC 20590. Shipper's certification means a statement on a shipping paper, signed by the shipper, saying he/she prepared the shipment properly according to law. "This is to certify that the above named materials are properly classified, described, packaged, marked and labeled, and are in proper condition for transportation according to the applicable regulations or the Department of Transportation." or "I hereby declare that the contents of this consignment are fully and accurately described above the proper shipping name and are classified, packed, marked and labeled, and are in all respects in proper condition for transport by * according to applicable international and national government regulations." Shipping paper means a shipping order, bill of lading, manifest, or other shipping document serving a similar purpose and containing the information required by Sec. 172.202, 172.203, and 172.204. Technical name means a recognized chemical name or microbiological name currently used in scientific and technical handbooks, journals, and texts. Transport vehicle means a cargo-carrying vehicle such as an automobile, van, tractor, truck, semi-trailer, tank car, or rail car used for the transportation of cargo by any mode. Each cargo-carrying body (trailer, rail car, etc.) is a separate transport vehicle. UN standard packaging means a specification packaging conforming to the requirements in Subpart L and M of Part 178.